From time to time, Company may revise this Agreement without any notice to You. You agree that, each time you access or use the Site, You shall review and abide by the then-current version of this Agreement. 1. General Information. Company provides visa and passport application, processing, authentication and other travel-related services. 3. Your Obligations and Warranties; Permitted Use. 3.1. Company may decline to provide you with any Service, for any reason, in its sole discretion. 3.2. You represent and warrant that you are a United States citizen or permanent resident alien. You acknowledge that the Services are offered only to United States citizens and permanent resident aliens. 3.3. You shall strictly comply with any request made by any Governmental agency (including, without limitation, any U.S. Passport Agency or embassy official) which is communicated to You by Company. You acknowledge that, in connection with any Service, such officials may request additional documentation and, in declining to issue a passport or visa, such officials may not disclose their reasoning. 3.4. You shall use the Site only for the purposes expressly set forth on the Site and in this Agreement. Any other use of the Site is prohibited. If there is a conflict between any statement on the Site and any provision of this Agreement, the provision of this Agreement will apply. 3.5. 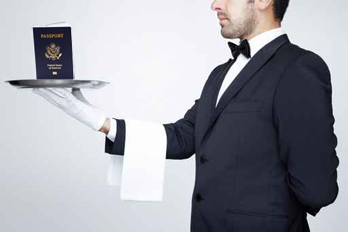 Immediately after Company returns your passport and other documents, You shall immediately confirm that you have obtained all visas required for your trip, the visas for each country you intend to visit are valid for the dates of your trip, and your passport is valid through the entire period of your planned trip(s) and for six months thereafter. You shall not purchase any ticket, or make any reservation, that is non-refundable until You have received all necessary travel documents (including, without limitation, all visas and passports). 3.6. Notwithstanding any other provision of this Agreement, You shall not: (a) access or use the Site for any purpose that is unlawful; (b) access or use the Site for any purpose that is not expressly permitted by the Site or this Agreement; (c) access or use the Site in any manner that could damage, disable, overburden, or impair any Company computer system, server, or network; (d) access or use the Site in any manner that interferes with any other person’s access or use of the Site; (e) attempt to gain unauthorized access to the Site, other accounts, or any Company computer system, server, or network; or (f) access or use materials or information through any means not intentionally made available by Company. 3.7. Notwithstanding any other provision of this Agreement, You shall ensure that your use and access of the Site and use of each Service complies with all applicable laws and regulations. You shall ensure that all information provided by You to Company in connection with any Service offered by Company is complete and accurate. 3.8. The Site is not intended to be accessed and used by persons under the age of 18. You represent and warrant that you are at least 18 years of age. If You are not at least 18 years of age, You shall not access or use the Site. 3.9. You shall not copy, distribute, or display, in any way, any information You find on the Site on any other website or electronic forum without the express written consent of Company. Company is the exclusive owner of the Site. 3.10. If You fail to abide by this Agreement in any way, or fail to pay any amount owed to Company when due, Company may prohibit you from accessing or using the Site. No action or omission by Company will be deemed to be a waiver of any right or remedy provided under this Agreement or under applicable law. 4.1. Company will respond to allegations of copyright infringement in accordance with the Digital Millennium Copyright Act (the “DMCA”). 4.2. If you believe that your work was copied or posted on the Site in a way that constitutes copyright infringement, please contact our designated agent D. Orbell. 4.3. Your notification of alleged infringement must comply with the provisions of the DMCA and must include the following information: (1) a description of the copyrighted work which You claim has been infringed (if you are not the owner of the work, you must also include your electronic or digital signature as a person authorized to act on behalf of the copyright owner); (2) a description of where the allegedly infringing material is located on the Site; (3) information reasonably sufficient to permit Company to contact you (such as an address, telephone number, and, if available, an email address where you may be reached); (4) a statement that you have a good faith belief that the use of the allegedly infringing material is not authorized by the copyright owner, its agent, or the law; and (5) a statement by You, made under penalty of perjury, that the information in your notification is accurate, and that you are the copyright owner or are authorized to act on the copyright owner’s behalf. 4.4. Upon receipt of such written notification, conforming to the DMCA and containing the information described in Section 4.3, Company will remove or disable access to the allegedly infringing material, forward the written notification to the alleged infringer, and attempt to promptly notify the alleged infringer that the allegedly infringing material has been removed. 4.6. Upon receipt of a counter-notification, conforming to the DMCA and containing the information described in Section 4.5, Company will promptly provide You, the party who delivered the original notification, with a copy of the counter-notification and inform you that it will replace the removed material, or cease disabling access to it, within ten business days. If Company’s designated agent does not receive notice from You that an action has been filed seeking a court order to prohibit the alleged infringer from engaging in the infringing activity complained of in the original notification, Company will replace the removed material, or cease disabling access to it, within ten to fourteen business days after receipt of the counter-notification. 5. Third-party Websites, Companies, and Services. Mention of, or linking to, third party websites, governments and governmental agencies, companies, and products on the Site is for informational purposes only and constitutes neither an endorsement nor a recommendation. Certain links on the Site will permit you to leave the Site. The websites linked by the Site are not under the control of Company and Company is not responsible for the content of any linked website. 6. Indemnification. You shall defend, indemnify, and hold harmless Company, its officers, directors, employees, and agents, from and against any claims, actions or demands, including, without limitation, all reasonable attorney’s fees and costs, made by any third party due to or resulting from your access or use of the Site or any Service, any breach of this Agreement by You, any false representation made by You in this Agreement, or any breach of a warranty made by You in this Agreement. 7.1. THE SITE AND ALL OF ITS CONTENT ARE PROVIDED “AS IS,” WITHOUT WARRANTY OF ANY KIND, EXPRESS, IMPLIED, OR OTHERWISE. TO THE FULL EXTENT PERMISSIBLE BY APPLICABLE LAW, COMPANY DISCLAIMS ALL WARRANTIES, EXPRESS OR IMPLIED, PERTAINING TO ALL CONTENT INCLUDING, BUT NOT LIMITED TO, IMPLIED WARRANTIES OF MERCHANTABILITY AND FITNESS FOR A PARTICULAR PURPOSE. 7.2. YOUR USE OF THE SITE IS AT YOUR OWN RISK. THE SITE MAY CONTAIN LINKS TO OTHER SITES. COMPANY IS NOT RESPONSIBLE FOR THE CONTENT OR PRIVACY POLICIES OF THOSE SITES. 7.3. ANY MATERIAL DOWNLOADED OR OTHERWISE OBTAINED THROUGH THE SITE IS ACCESSED AT YOUR OWN RISK AND YOU ARE SOLELY RESPONSIBLE FOR ANY DAMAGE TO YOUR COMPUTER SYSTEM OR LOSS OF DATA THAT RESULTS FROM THE DOWNLOAD OF SUCH MATERIAL. 7.4. IN NO EVENT SHALL COMPANY BE LIABLE FOR ANY SPECIAL, INCIDENTAL, INDIRECT, OR CONSEQUENTIAL DAMAGES WHATSOEVER ARISING FROM YOUR ACCESS OR USE OF, OR INABILITY TO ACCESS OR USE, THE SITE OR THE PRODUCT. 7.5. IN NO EVENT SHALL COMPANY BE LIABLE FOR ANY DAMAGES WHATSOEVER ARISING IN ANY WAY FROM ANY CONTENT PROVIDED BY OR REPRESENTATIONS MADE BY ANY OTHER PERSON OR THE ACTIONS OR OMISSIONS OF ANY OTHER PERSON. 7.6. IN NO EVENT SHALL COMPANY BE LIABLE FOR ANY DAMAGES WHATSOEVER ARISING IN ANY WAY FROM ANY ACT OR OMISSION BEYOND ITS CONTROL INCLUDING, WITHOUT LIMITATION, ANY ACT OF GOD, WEATHER CONDITION, ACT OF TERRORISM, WAR, STRIKE, CIVIL COMMOTION, OR ACT OR OMISSION OF ANY GOVERNMENTAL AUTHORITY. 7.7. IN NO EVENT SHALL COMPANY BE LIABLE FOR ANY DAMAGES WHATSOEVER ARISING IN ANY WAY FROM ANY LOSS OR DELAY OF ANY SHIPMENT ENTRUSTED TO AN OVERNIGHT DELIVERY SERVICE. 7.8. COMPANY’S ENTIRE LIABILITY TO YOU FOR LOSS OR DAMAGE TO A PASSPORT DURING VISA OR PASSPORT PROCESSING SHALL BE LIMITED TO THE LESSER OF: (1) THE ACTUAL REPLACEMENT COST OF THE VISA OR PASSPORT; OR (2) $100. IN ANY EVENT, COMPANY’S ENTIRE LIABILITY TO YOU UNDER ANY PROVISION OF THIS AGREEMENT OR ARISING FROM THE ACCESS OR USE OF THE SITE BY YOU OR ANY OTHER USER SHALL NOT EXCEED THE AMOUNT ACTUALLY PAID BY YOU TO COMPANY PURSUANT TO THIS AGREEMENT DURING THE 12 MONTHS PRECEDING THE EVENT GIVING RISE TO SUCH LIABILITY. 7.9. EACH SERVICE IS PROVIDED “AS IS,” WITHOUT WARRANTY OF ANY KIND, EXPRESS, IMPLIED, OR OTHERWISE. COMPANY DISCLAIMS ALL WARRANTIES, EXPRESS OR IMPLIED, PERTAINING TO ANY SERVICE INCLUDING, BUT NOT LIMITED TO, IMPLIED WARRANTIES OF MERCHANTABILITY AND FITNESS FOR A PARTICULAR PURPOSE. WITHOUT LIMITING THE FOREGOING, COMPANY EXPRESSLY DISCLAIMS ANY WARRANTY AS TO THE AMOUNT OF TIME IT WILL TAKE TO COMPLETE ANY SERVICE PROVIDED BY COMPANY; ALL REPRESENTATIONS AS TO THE TIME NECESSARY TO COMPLETE ANY TASK ARE ESTIMATES ONLY. 8. Governing Law. This Agreement is governed and shall be construed by the laws of the Commonwealth of Virginia, without regard to its conflict of law provisions. 10. Attorney’s Fees and Costs. In the event of any litigation arising under this Agreement for from the use or access of the Site by You, the substantially prevailing party shall be entitled to recover from the non-substantially prevailing party all of its costs and reasonable attorney’s fees incurred in such litigation. 11. Severability. In the event that any provision of this Agreement is invalidated by a court of competent jurisdiction, then all of the remaining provisions of this Agreement shall continue unabated and in full force and effect. 12. Binding Effect. This Agreement shall be binding upon each of the parties and upon their respective successors and assigns, and shall inure to the benefit of each of the parties and to their respective successors and assigns. 13. Entire Agreement. This Agreement contains the entire understanding and agreement between the parties as to its subject matter and shall not be modified or superseded except upon the express consent of both parties. This Agreement is not intended to confer upon any person, other than the parties, any rights or remedies.